The federal government wouldn’t go to the coast for a public meeting — so the people who live on the coast came to them. 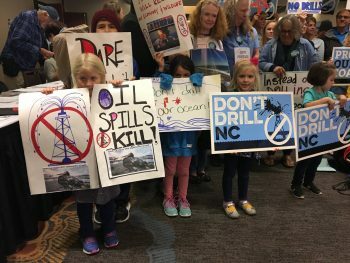 More than 500 people attended Monday’s Rally to Raleigh, with approximately 200 riding buses from Wilmington, Morehead City and Nags Head to make their voices heard at the state’s only public meeting about the proposed oil and gas exploration plan. The Bureau of Ocean Energy Management (BOEM) hosted a public information meeting on the draft 2019-2024 National Outer Continental Shelf Oil and Gas Leasing Program at the Hilton North Raleigh/Midtown. BOEM officials were on-site to answer questions about the proposed plan and comment process. They also provided laptops and forms for people to submit their comments on the plan. At the same time, the Offshore Oil Coalition hosted a rally in another part of the hotel, where people made signs, learned more about the issue and later listened to speakers. Due to construction, participants had to walk outside to navigate between the rally and the BOEM area, but that didn’t deter people’s enthusiasm. Several speakers from various backgrounds — including a restaurant owner, a commercial fishermen, a pastor and local and state officials and politicians — took the podium to talk about the myriad ways offshore oil drilling would negatively affect the North Carolina coast. Offshore oil drilling puts the coastal environment and economy at risk. Lee Nettles, director of the Outer Banks Visitors Bureau, said that coastal tourism is a $3.4 billion industry in North Carolina. A commercial fishermen, Mark Hooper, noted that commercial fishing has an economic impact of $700 million in North Carolina. Both of these industries would be severely affected in the event of a spill. Other speakers, which included Rep. Duane Hall of Wake County; Kill Devil Hills Mayor Sheila Foster Davies; Dare County Commissioner Bob Woodard; Briggs McEwen, owner of Lisa’s Pizzeria in Rodanthe; Rep. Deb Butler of New Hanover County; and Rev. Emily Carroll of Durham, emphasized both the risks to local businesses and to people who rely on the coast for their livelihoods, as well as the risk to the coast’s natural beauty and wildlife. Cooper and Regan met with Interior Secretary Ryan Zinke earlier in February to request that North Carolina be exempted from the plan, as well as for public meetings to be held on the coast. While there were not any held on the coast during this comment period, Regan said that would be something they’d continue to request for the next comment period. The comment period on the draft proposed program ends March 9. Kelly Hammerle, the national program manager for this plan at BOEM, said that these comments will be taken into account during the development of BOEM’s proposed program and the draft Programmatic Environmental Impact Statement. Hammerle said these will be published by the end of 2018 at the earliest. There will be a 90-day comment period following the publication of these documents. To submit a comment for the current period, click here. The buses and rally event were sponsored by: the North Carolina Coastal Federation; Oceana; Cape Fear Chapter of the North Carolina Sierra Club; Cape Fear and Outer Banks Chapters of the Surfrider Foundation; Crystal Coast Waterkeeper; Citizens Protecting the Atlantic Coast; Southern Environmental Law Center; NC Conservation Network; NC League of Conservation Voters; Environment North Carolina; Center for Biological Diversity; Save Our Sea NC; and Brunswick Environmental Action Team.